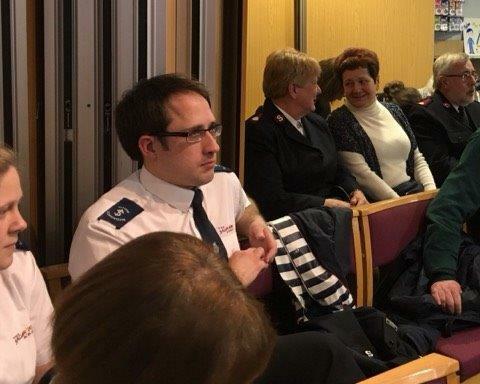 Our morning meeting, led by Major Ian Payne, was based on Matthew 5:42 and centred around the theme of giving, coinciding with our self-denial altar service. Gowans’ and Larsson’s lively song ‘That’s the Spirit’ (SASB329) opened the meeting, supported by the Band, before ‘Lord, Thou Art Questioning’ (SASB607) set a quieter atmosphere for prayer. The Singing Company then sang ‘Without Love’, a thought-provoking song as we considered our motivations for giving. 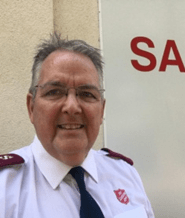 This was followed by the final self-denial video which gave us insight into the work of the Salvation Army in the Caribbean Territory, with a particular focus on Havendale Corps in Jamaica. 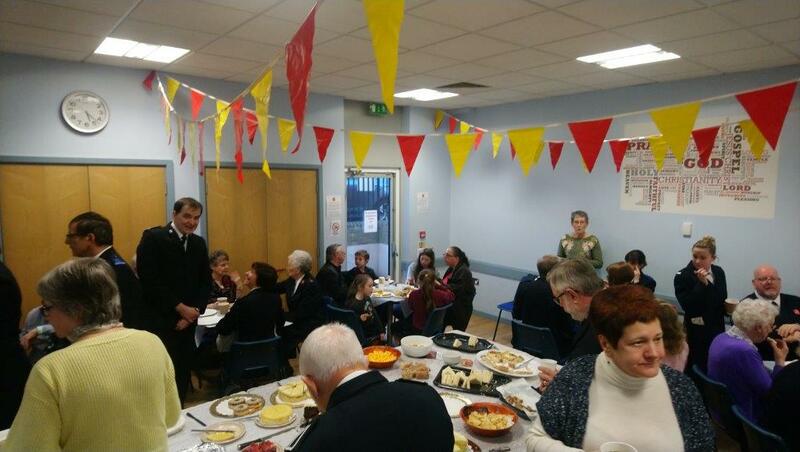 Having seen the type of project which could be supported by our giving, the congregation filed past the Holiness Table to give in the self-denial altar service, during which we sang ‘They Need Christ’, an apt reminder that ‘There are people hurting in the world out there – they need you, they need me, they need Christ’. In response, the Songsters brought Lee Fisher’s uplifting song ‘God is Greater’; a reminder that none of our concerns or issues are beyond the power of God, and that his love, grace and strength remain the same at all times. ‘God is greater, God is stronger than the trials you have to face’. In reflecting on this, we sang ‘And is it so’ (SASB570), the chorus of which echoed Ian’s words with the line ‘I have not much to give thee Lord, but what I have is thine’. ‘Lord of Creation’ (SASB380) ended the meeting before the Band went out into the High Street for a time of outreach. 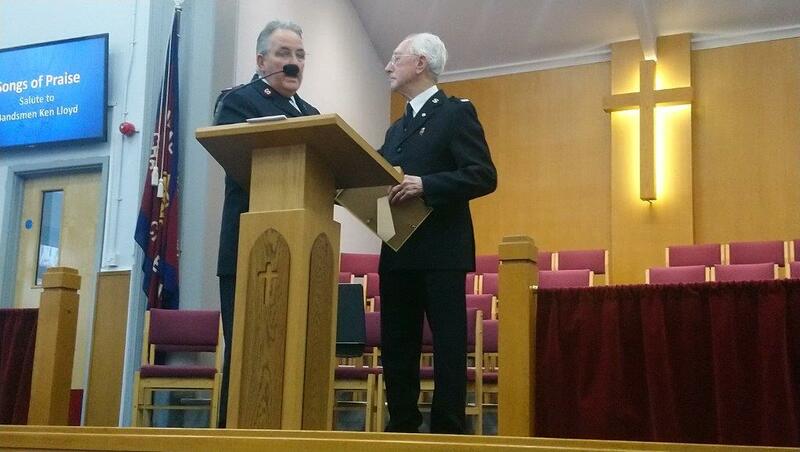 Our 4pm meeting took the form of a Songs of Praise, honouring the service of Ken Lloyd who is leaving the Corps after 69 years in order to move nearer his family. Many members of Ken’s family had travelled to Chatham for the afternoon and heard of Ken’s positive influence in the Corps over many years. Ken’s departure marks the end of a long family association with Corps, dating back to its days as ‘The Christian Mission’ in the 1870s. The afternoon’s songs were all Ken’s choices, opening with ‘To God Be The Glory’ (SASB279) and ‘The Christ of Calvary’ (SASB91). 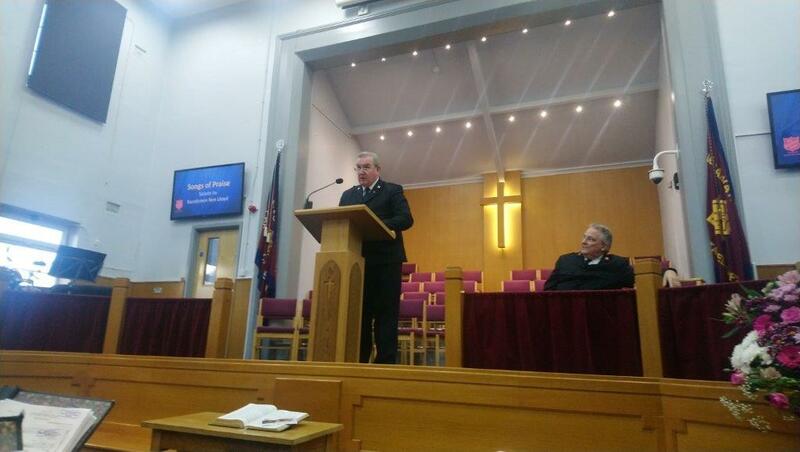 After a time of prayer, led by Graham Hatton, Bev Hudson paid tribute to Ken on behalf of the Corps. Bev spoke about Ken’s work with the Baden Powell groups and his service during 17 years as Band Librarian. 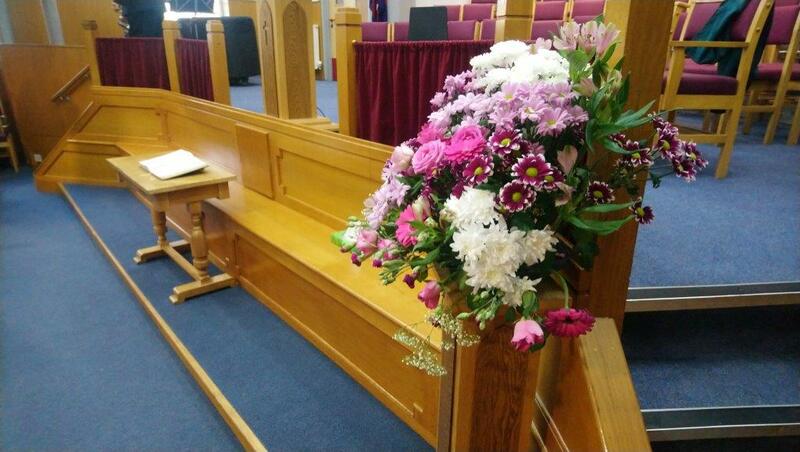 Ken’s practical work was also remembered, including his faithfulness in helping to clean the hall and his construction, with Frank Reynolds, of the oak Mercy Seat which remains at the front of our hall. Between verses of ‘Who comes to me’ (SASB447), other members of the Corps also shared reflections on Ken’s time in the Corps. At Ken’s request, the Songsters sang ‘We Are An Army’, published in 1971. The Band contributed the march ‘Young Campaigners’ before Ken was presented with a certificate of recognition and appreciation. The congregation stood as prayers were offered for Ken as he settles in his new home, and as thanks were given for his remarkably long service to the Corps. ‘Joy In The Salvation Army’ (SASB963) and ‘O Boundless Salvation’ (SASB509) closed the afternoon. Members of the Corps then joined Ken and his family in the Bradbury Hall for tea, sharing many fond memories and stories from the past. We are grateful to Ken for his significant contribution to the life of the Corps and pray God’s blessing on him for the future. This entry was posted in Church Life, Monday Spot, Service, Worship. Bookmark the permalink.